These groups are saving the lives of mums-to-be, new mothers and their babies – enabled by the generosity of donors and supporters making donations. Mikey explains more about his visit: “I met groups in Maniwatta and Sisin villages in Nicaragua. The groups bring men and women together to collaborate and develop real, practical solutions to solve their problems. 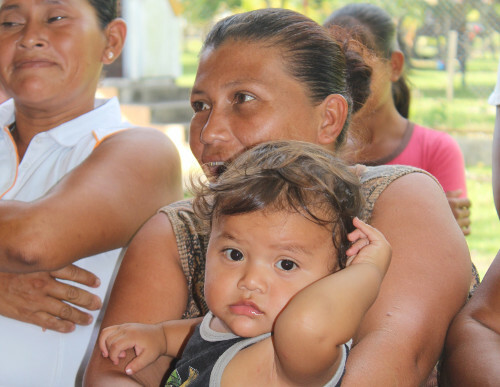 “In Nicaragua, some of the biggest risks to mothers and babies lives are malaria, diarrhoea and pneumonia. “For example, to reduce the risk of malaria, spread by mosquitos, the groups led community cleaning campaigns. This involved cutting back bushes and draining stagnant water, leaving no areas for the insects to breed. The groups really came together to solve the problem. “Diarrhoea was prevented by lobbying the local health facilities. They provided chlorine sachets that could be added to water, making it clean and safe to drink. “Preventing pneumonia was done through door-to-door visits in the community. These provided vital information, education and advice on how to keep babies safe. “None of this could be achieved by working alone. The groups bring people together, giving them a stronger voice. “In fact, before the groups, there was only one nurse in the area. Together the groups pressured the local health authority for more staff. Doing so meant a doctor and three nurses were posted to the area – including a nurse recruited and trained from within the community itself. “The groups are a long-term solution; they empower people to overcome challenges and change their lives for the better. You can donate and support this essential, life-saving work taking place in Nicaragua and worldwide here.